While feeding my little one earlier today I decided to use the time to also surf the Purl Bee website to see if it has been updated and to refresh my memory on how to do a double fold binding (for quilting), when I came across this post (again!) about the Baby Surprise Jacket by Elizabeth Zimmermann. 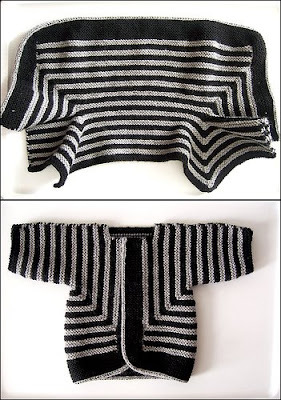 A few months ago I kept coming across this cute li'l jacket on Ravelry and various blogs and have since been wanting to knit one up for my li'l guy, yet wasn't sure of the size range of the pattern (which I just found out varies, depending on your swatch/guage). I'm not willing to purchase the book(s)* for one pattern, and unforunately the public library here is not as well stocked as I thought it would be. Maybe because I'm so used to public libraries like the Colosseum look-a-like Vancouver library, who has a copy of the book this pattern is in. So after being discouraged at the lack of being able to find the pattern to make a BSJ, I forgot all about it. But then the past few days this jacket has been popping up everywhere...again! I think it's calling out to me and is demanding that I find this pattern and make it. I love how it is knitted all in one piece, as pictured in the top of the photo above, but miraculously transforms into a jacket with a simple sewing of 2 small seams. I've seen pictures on Ravelry where some knitters have added a simple collar and even a hood! The possibilities are endless with this jacket! I would love to knit my son this jacket in blue with chocolate brown trim, and knit it big enough so that it could fit him when he's 1 or 2 years old. Then, depending on how well/fast it knits up, maybe make another one for him for when he's older. After surfing all the pictures/projects** of this jacket on Ravelry (and making myself want to knit this even more so) I found out that there was also an adult version as well!! Oh...?? So I wasted some more time on Ravelry by looking at everyone's pictures of their finished Adult Surprise Jacket...just glad my little one fell asleep and was taking his afternoon nap! The more I looked at the pictures though, the more I realized that this jacket was more suitable for...well, much older people. The jacket really has no shape and almost appears blob-like on almost everyone. I'm so short and petite that I would probably look like a tea pot in such a garment. That is until I stumbled upon one Ravelry member who knitted theirs in a cardigan-like fit with a more stylish, and dare I say trendier color palette. Not to mention this member also appears to be much younger than the others that have knitted this pattern. As in under 30 years old younger. But then it hit me, even though she claimed that she is also short and petite, she also appears to be one of those stick figure types who can pull off the bulky sweater look without turning into a Michelin Man clone. I, on the other hand, would resemble the Pillsbury Dough Boy. Check out her pictures on her blog post about her jacket here. I'm still curious about this ASJ though. I'm thinking I shouldn't get too far ahead of myself here and try my hand at the BSJ first before even considering knitting myself the ASJ. Has anyone knitted the BSJ? What are your thoughts on it? How long did it honestly take you to knit it up? What do you think about the pattern in general? Has anyone else knitted a more fitted ASJ? * I say book because the original publishing is in the book The Opinionated Knitter, and have since been re-published in various other Elizabeth Zimmermann pattern books. All of which only have that one pattern that I would want to use. ** I discovered that this pattern has also been published in a few knitting magazines with variations and updates. The possibility of ordering a back issue feels like a better option than a book. Yet I always have problems with ordering back issues of magazines, solely on the fact that I am located in Canada and not in the US. But I must explore this option some more. Has anyone ordered or have a magazine that this pattern is in? There are so many different magazines/years that I have no idea which one would be more bang for my buck. I'm a beginner (3 years) but found this easy, easy to knit - just keep going and it'll all work out in the end. Thanks for the tip, but I found a copy of The Opinionated Knitter, which has the pattern. I'm in the process of knitting it up, got to the point where I need to add the button band, and then took a hiatus. I should really finish it up before my son outgrows it and I'll have to re-knit it.